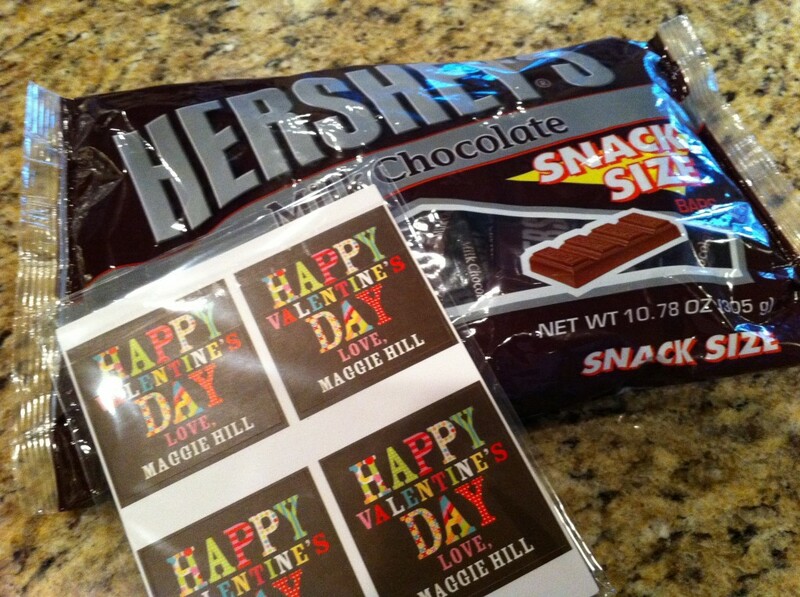 These are the girl’s Valentine’s that she’ll be passing out next week. Valentine’s Day is next week right? Pretty sure that’s right. Anyway, I wanted to share it with you because I thought it was a fun idea. I went onto tinyprints.com to look at maybe doing a fun picture of the girl for her valentines this year. Everything I looked at seemed a little young. I mean, she is in the 4th grade now. She’s ALL grown up. Then, I ended up in the label section. Hmmm… I thought. We could just get labels and stick them on candy. It’s the candy the kids want anyway. The cute little cards just end up in the trash. So, I ordered some labels and bought some fun size candy bars. And, valentines are already done. Well, they’re almost done. The girl has to finish sticking the labels on. I even picked up some of the giant chocolate bars that were on sale last week (or was it this week… it’s a blur) at Kroger. She’s going to give these to her teachers. Teachers need A LOT of chocolate. Trust me on this one. 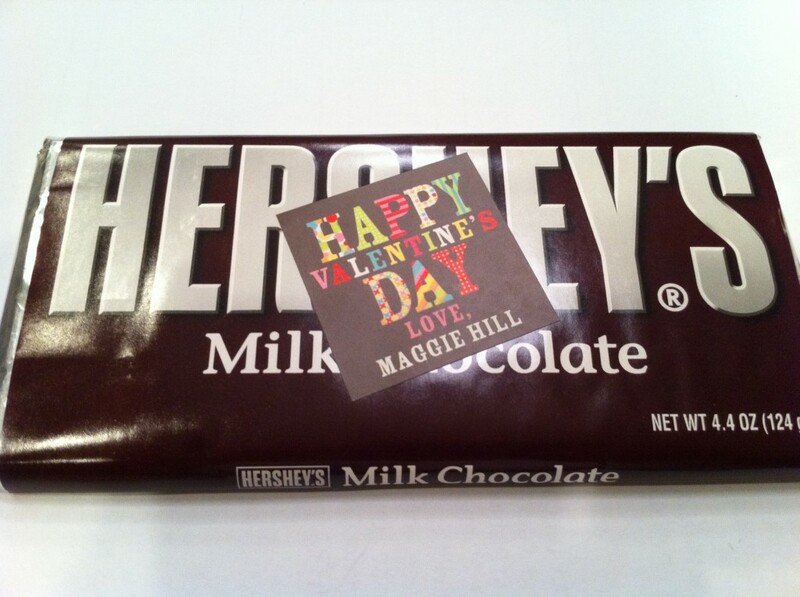 What are you doing for your kids’ valentines this year? My awesome friend, Jessica, did a little Tiny Prints research. She discovered that you can get stuff this weekend if you use the Rush Delivery. And, she found a code SR995 that will give you $5 off. So, thanks Jessica! BTW – I’m not being paid by Tiny Prints. I just like their stuff. 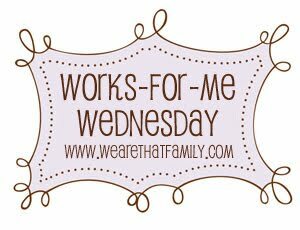 Linked to Works for Me Wednesday. I am SO EXCITED to share this book with you today. 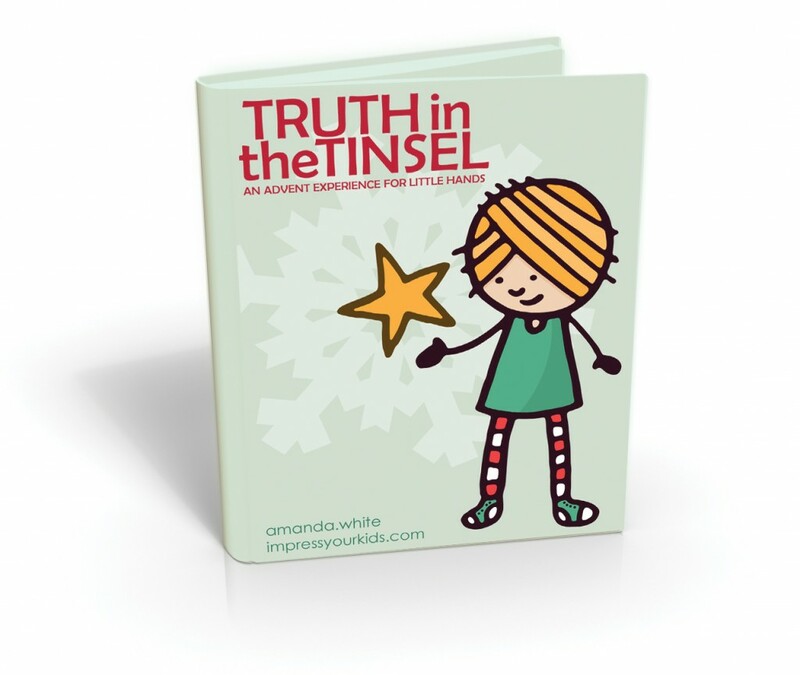 My real and bloggy friend, Amanda, has created an AMAZING resource for you and your children. AMAZING I say. Amanda has taken each day of December and made it a teaching opportunity for your child as well as a crafting opportunity. What an awesome way to spend the month celebrating the birth of our savior – quality time with our children reading scripture, discussing it and making it real for our littlest family members. There is a (short) scripture reading for each day. Each day you open the Bible with your child. Love that. The crafts are EASY – mostly using things you have around the house. Meaning you don’t have to be super-mom in order to pull them off. Amanda gives you the words to say in order to discuss the scripture with your children. What a gift. There are multiple plans – as in you DON’T have to do a craft EVERY DAY if that overwhelms you. Just pick a plan and do several throughout the month. This FABULOUS book will be available TOMORROW – BLACK FRIDAY at a reduced rate! Do yourself a favor a pick up a copy! Disclosure: I was given a copy of this ebook to preview. ALL opinions are my own. Top Ten Tuesday: Where’d My Baby Go? 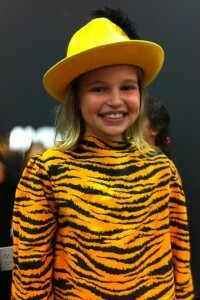 This is a picture of the Princess as Thomas O’Malley in a production of “Aristocats” at a local children’s theater last week. Do you see how big she looks? Do you see? What in the world? 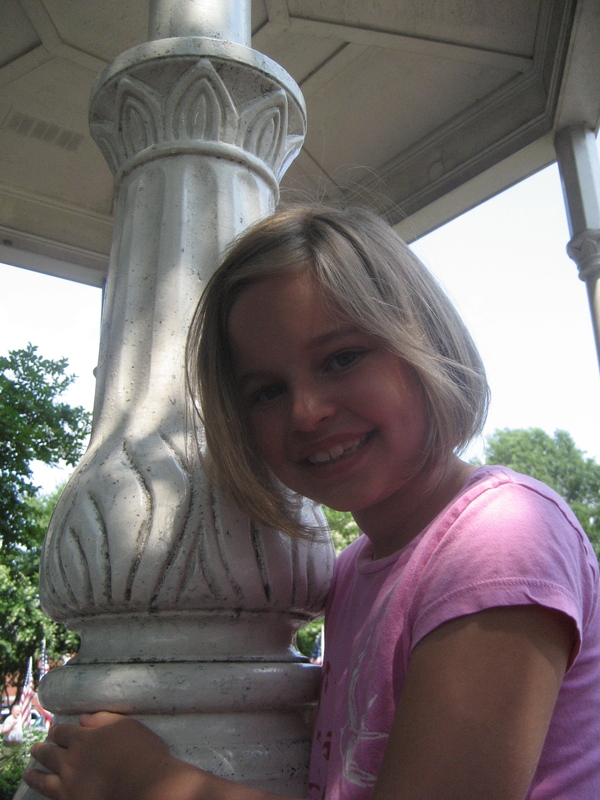 What happened to THIS LITTLE GIRL? It’s not just the pictures that are telling me my baby is growing up. Oh no. We’ve got all kinds of “big girl” coming out here at the House of Hills. I can tell you that we are literally in the middle of a “tween” invasion. 1. I no longer get a hug and kisses when dropping her off at places without demanding asking for them. 3. She actually cares about her hair. As in the box of all the clips and hair bands and what not that she’s had FOREVER is actually on the counter and in use. She even asks her daddy if she looks “good.” What? What? 5. When we go through the Chick-fil-a drive through, I’m now ordering a #5. I can no longer get the kiddie meal. It doesn’t fill her up. Seriously. 7. 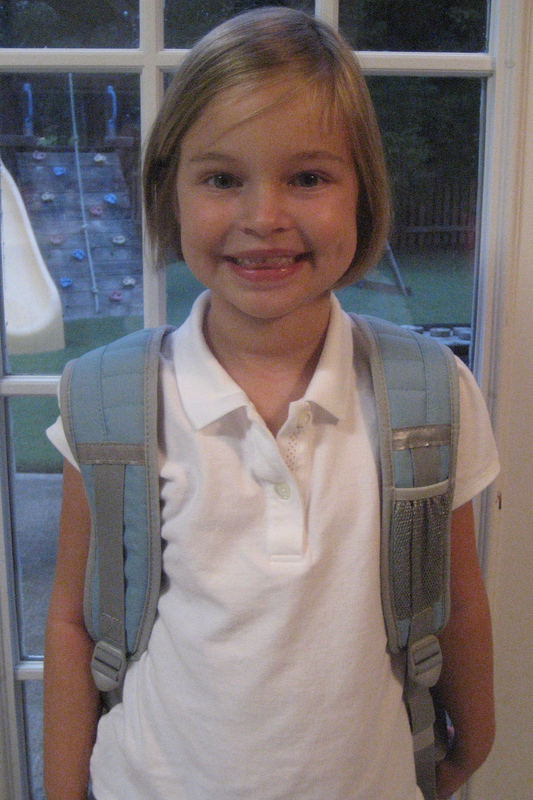 She’s going to be in the fourth grade in a week. THE FOURTH GRADE! What? I taught fourth grade. Those kids are big! Oh my heart. 8. She is only 9 inches shorter than me. Now, I’m short. Let’s just get that out there. However, it is still hard to accept the fact that your child is up to your shoulder. Seriously. Hard. 10. She is becoming more and more helpful, more a part of the House of Hills team. She does what’s asked without complaining most of the time and is even picking up her room every once in a while on her own. She’s starting to see what needs to be done and doing it. Wow! So ya, my baby is growing up. That’s what she’s supposed to do right? Grow up. Other times it hurts my heart because it wants to burst with pride with the young woman she’s becoming. I mean. She’s still my baby right? She’ll always be my baby. And at night… when she’s tired… she still crawls in my lap and cuddles. And it is pure bliss. 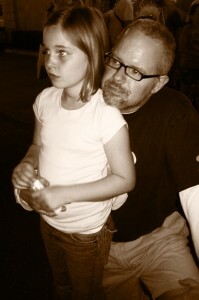 I love this man who holds my daughter so tenderly, so lovingly, so daddily. I love this man who gave me amazing joy as a wife before he ever made me a mother and never forgets that I am his number one girl. I love this man who has shared his passions with his daughter to the point where they have become hers too. I love this man who has patience enough to play Lego Wii games when he knows they are never going to get every brick in the level. I love this man who makes sure that Friday afternoons are reserved for his Princess. I love this man who takes his daughter on dates so she knows how a man should always treat her. I love this man who every day is an example of our heavenly Father’s love for us, teaching my girl that she is loved unconditionally. I love this man. Happy Father’s Day to the love of my life whom I’m blessed to call husband and my girl is blessed to call Daddy. Wordless Wednesday: Growing Up Fast!! 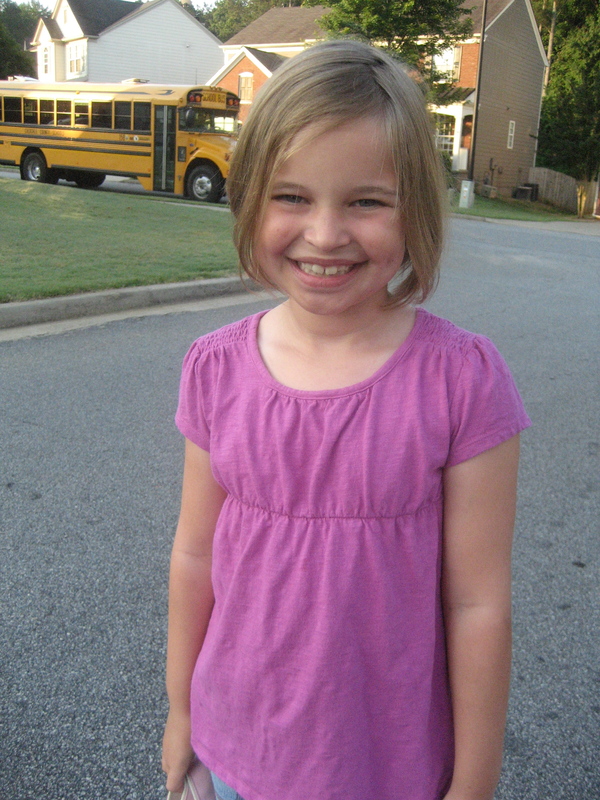 The Princess had to take a picture in to school for her teacher’s scrapbook. We printed this one. I keep looking at it. WHEN did she get this big? This beautiful? This wise? I took the Princess to see Santa today. I take her every year so this is not earth shattering. However, this year was different. Somehow, I knew that this year, she was doing it for me. She didn’t need to see Santa. She had already written him a letter. More importantly (and I think she’s realized this), she had told her dad and I what she really wanted for Christmas. She had her bases covered. She didn’t need to see Santa, but somehow she knew that I needed her picture with Santa. I’ve always taken my baby girl to see Santa. 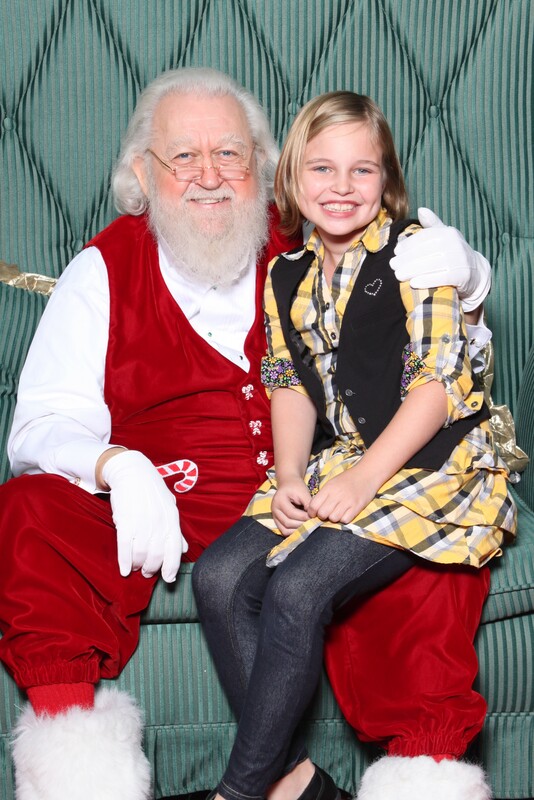 As we were standing in line, she whispered to me about the fact that she always got her picture taken with “her Santa.” She knew there were other Santas at other malls. That these couldn’t all be the real Santa. He must still be at the North Pole. I think she whispered because there were small ones about. She didn’t want to ruin the magic for them. I wonder if she even realized she whispered. We stood in line… For almost an hour. She didn’t complain. She didn’t whine. She let me take her picture. She smiled at me when asked. She smiled at the babies in front of us and those behind us. She didn’t comment that she was one of the oldest kids in line. She didn’t fuss that she was tired. She let me put a bit of lipstick on her and comb her hair when it was close to her turn. 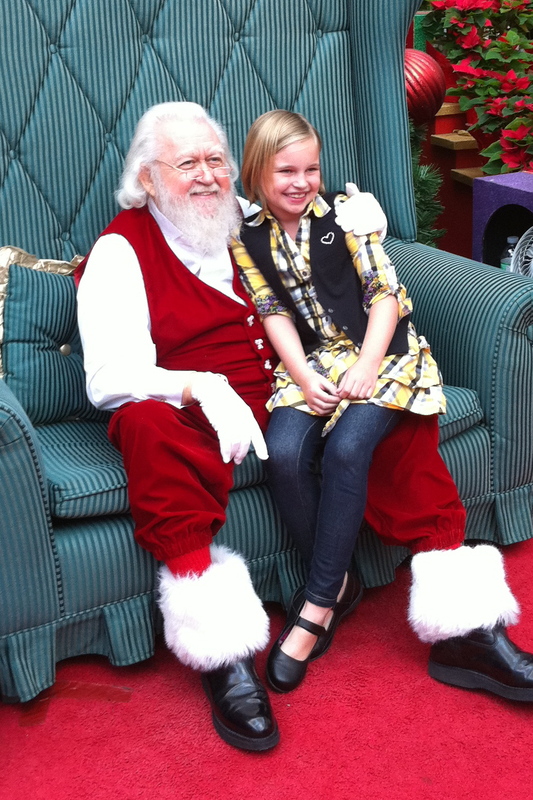 Then, she went and sat on the same Santa’s lap that she’s sat on every year of her life. She smiled prettily at my iPhone. She smiled prettily at the camera. She talked to Santa for a bit. And then she was done. Our turn was over in minutes, many fewer minutes than we had spent standing in line. Patiently standing in line. She smiled at me as I paid for the pictures and held my hand as we walked through the mall. “Momma, I want to buy you a Christmas present this year,” she said. Little did she know that she’d already given me my most precious one. And here it is (after a trip back to the mall to get it on the empty USB drive they gave me originally), the “official” Santa picture. I’ve got MANY MANY MANY pictures just like this one. The Princess and a chocolate ice cream cone. 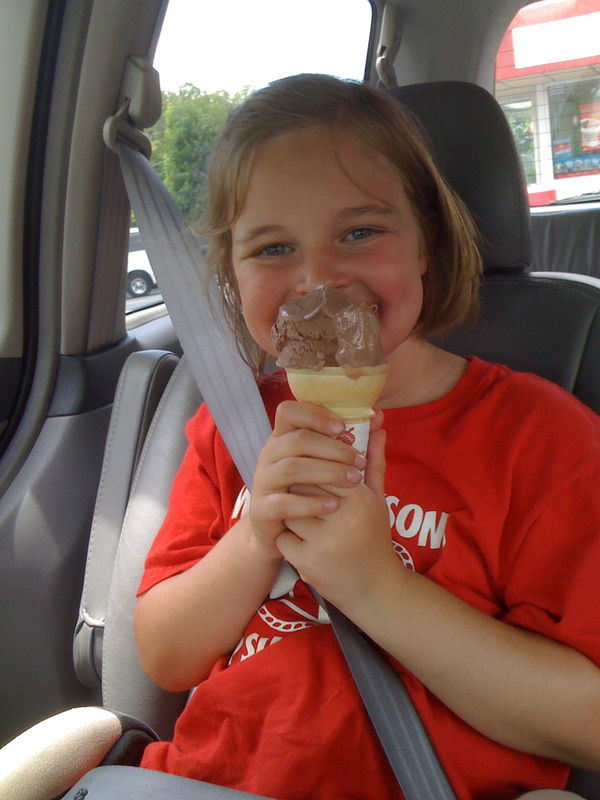 She LOVES some chocolate ice cream, especially if it’s from Bruster’s. I mean LOVES it. Like she would do anything for it. She would even hold out her finger to get it pricked so the nurse could test her blood. So, when the nurse had to prick a second finger on Monday, I promised her ice cream. I promised her Bruster’s ice cream. Ya, I bribed her. Does that make me a bad Mommy? Na, I think it makes me smart and resourceful. I know what to do to get the results I need. I’m sure you never bribe your kids – right? Chocolate ice cream – it works for me – EVERY time. It’s that time of year where I sit and look at pictures and wonder what happened to my baby girl. 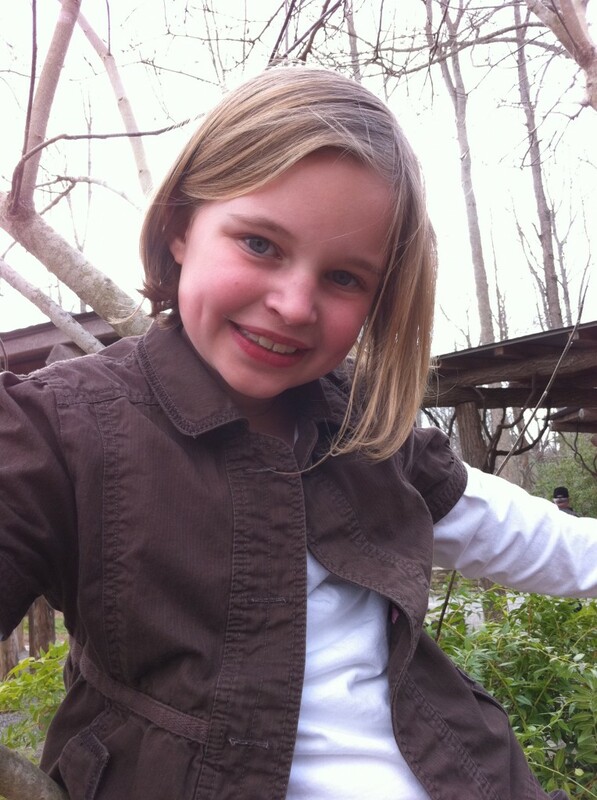 She seems to grow by leaps and bounds, and the passing of time never seems more clear as when you compare pictures. So, here are a couple of comparisons for you. How is she getting SO big SO fast? How do I make it stop!!!??? She’s so beautiful. So grown up. Especially when you compare it to a picture from almost a year ago where she’s wearing the same shirt, when it was MUCH looser. 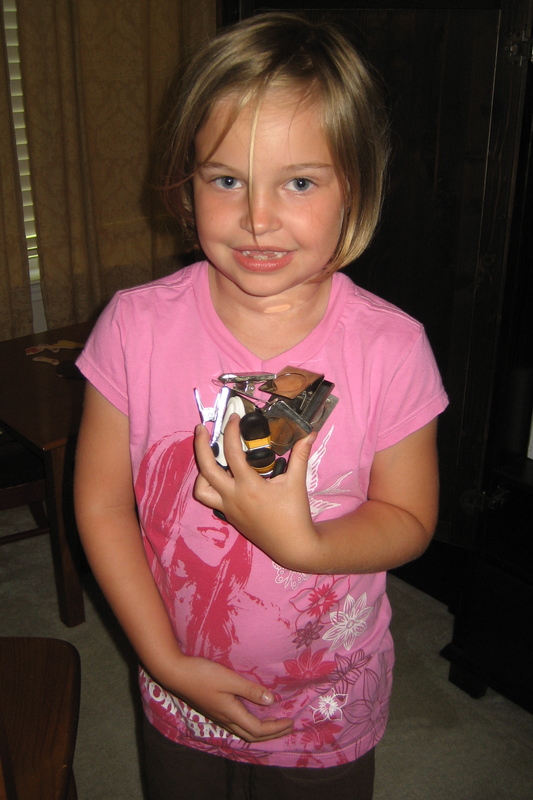 I don’t know if you can see it, but in the picture from last year, she’s missing half her teeth in the front! They are now all back in beautifully! I know they have to grow up. I know that I can’t stop it, but every once in awhile I want to pause time. To just stop and look at this amazing young lady she is becoming. To enjoy the stage that she is at on THIS day. To just cherish THIS moment. Do you love your child’s teacher? Perhaps you are your child’s teacher? I We made the decision when the Princess was about three that I couldn’t homeschool her. I’ve got a Masters Degree in Education, and there is NO WAY I could homeschool my own child. She and I are too similar. I would fear for her safety daily. Seriously. So, when the time came, we sent her off to public school. 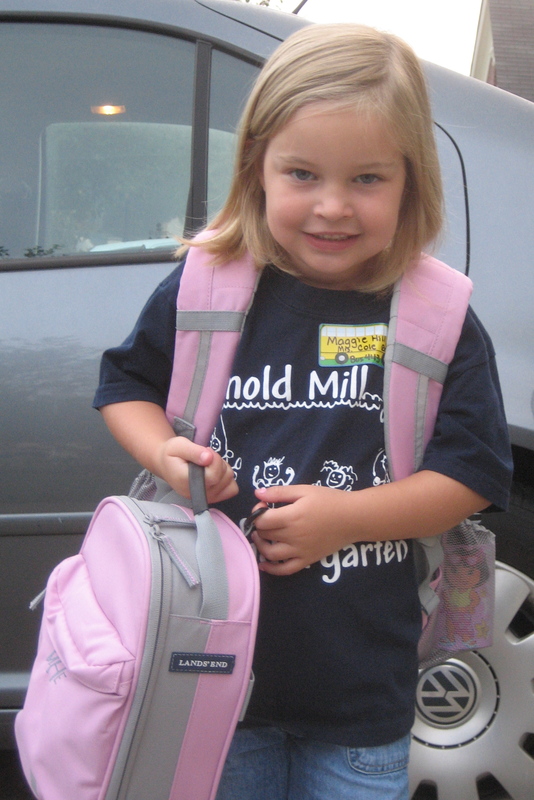 (Did you see the adorable picture of her first day of Kindergarten?) We considered private, but ended up deciding on public. Long story short, we really felt led to go public. We live in a great school system, and have had amazing teachers all three years. Mrs. J also has an amazing rapport with the parents. I know that if I were teaching in the Princess’s school, Mrs. J and I would be great friends. She teaches in a style VERY similar to the way I taught. That probably endears her to me the most. Knowing that my daughter is getting as good an education as I could give her, but without the relational upheaval we would have if I was the one giving it to her. Talk about the best of both worlds! Teacher Appreciation week is coming up, and I’m going to spoil Mrs. J. She’s definitely a thing I love. 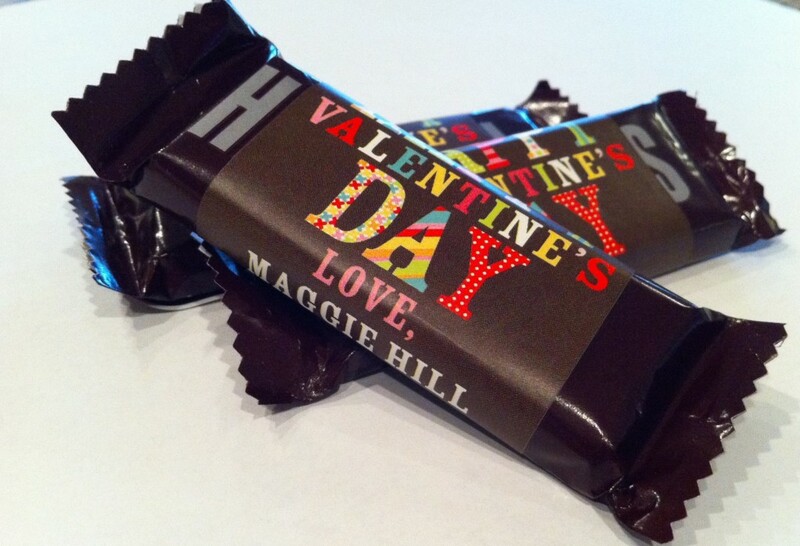 In fact, I think I’ll send her a box of chocolates today! She deserves them. Why wait for teacher appreciation week?! 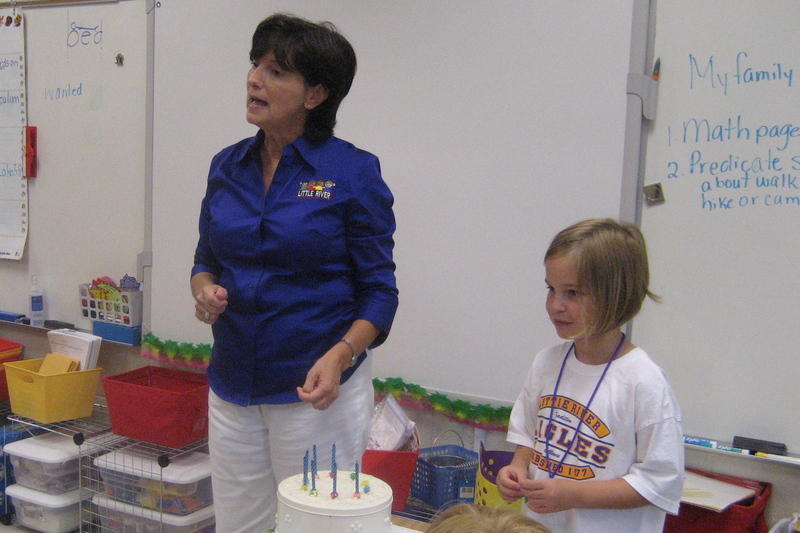 Do you love your child’s teacher? To see what others love, visit Things I Love Thursday. A few weeks ago, the Princess and I were enjoying a Sunday afternoon at the mall. That is, we were enjoying it until I got totally frustrated with her about her whining. It had gotten out of control. Whenever she didn’t get her way, she whined. Whenever I said we were going to do this or that, she whined. I HAD HAD IT! My Princess has life pretty good. She doesn’t have to share with any siblings. We make sure she gets alone time with each parent individually, nurturing those individual relationships. We make sure we have family time weekly, nurturing the entire family unit’s relationship. We make sure we spend time on our marriage, ensuring that she knows we love each other and that we will always be together. We make sure she knows she is loved unconditionally and feels safe. And, she lacks for NOTHING. Absolutely NOTHING as far as material things. So, when the whining had hit a crescendo, I felt like I was living with a spoiled rotten brat (who I had taken to the mall for an afternoon of fun for goodness sakes), and I was done with it. DONE WITH IT! Upon the uttering of yet another whine from the Princess’s beautiful mouth, I turned on her and in a VERY FIRM voice, “The next time you whine you owe me a quarter. I’m sick of listening to it. Now you’re going to have to pay me for listening to it.” She looked at me rather stunned. And, we went about our day. In no less than 20 minutes, she uttered a whine. I looked at her, raised my eyebrows, and she proceeded to pull out her coin purse and give me a quarter. No fuss, no whining. She realized quite quickly that whining about paying me for whining was going to cost her another quarter. I earned $2 that day. I earned $1.50 the next. I earned $.50 the next. That’s all it took. Three days. The whining was gone. Well, it still creeps in every once in awhile. And then, she has to go find me a quarter. This isn’t the first time we’ve had to do a crack down on a behavior. And, I’m sure it won’t be the last. The key with the Princess is to find her current currency. In the past, it’s been book time or tv time or computer time. Right now, it’s actual currency. She does not like to part with her cash. However, it’s not the actual paying me the money that made the whining stop. It’s the fact that we both stopped and recognized the behavior I wanted to go away. I had to point out when she was doing the whining. It’s all well and good to say “Stop Whining.” But, if I say, “You’re whining. Right now. You owe me a quarter,” she recognizes the behavior that needs to stop. When she was younger and I wanted a behavior to stop, I would put five to ten pennies on the counter at the beginning of the day. Every time the behavior was exhibited, I would tell her to go bring me one of the pennies. It always only took a few days to stop the behavior. Now, I will qualify that I have a “people pleaser” child, and one who has quite the conscious. She doesn’t like to be in trouble. The other key to the plan was that I had to be intentional. Me. The Mommy. I had to pay attention. Rather than getting frustrated and just fussing (which is close to whining isn’t it- hmmm) at her, I had to remember to ask for the quarter. EVERY TIME! I had to be on my best mommy game. I had to be consistent. Without consistency, it won’t work. But it did work for me. Just asking for the quarter. For more great tips, visit Works for Me Wednesday.